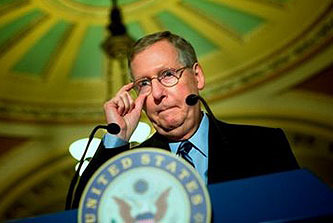 Jon Chait notes that McConnell “must want to tear his hair out.” After all, he’s relentlessly opposed Obama and the Democrats, and the fact that he hasn’t been successful is largely due to the simple fact that Democrats have a huge majority in the Senate. Mainly, of course, McConnell’s woes are a demonstration of what happens when people get pissed off: they don’t really care much about objective reality, they just want to register a protest. And voting for Mitch McConnell’s guy doesn’t feel like a protest. But there’s a second-string angle to this story that’s sort of delicious too. Basically, the lesson is that if you live by the Senate rules, you can also die by the Senate rules. McConnell, after all, didn’t fight Obama by mounting a loud and uncompromising PR campaign against him. That would have been counterproductive. Instead, he did what a Senate leader can do: he worked behind the scenes to keep his caucus united and manipulated parliamentary procedure and the Senate’s absurd rulebook to engineer an endless series of filibuster, holds, and delaying tactics. He did a pretty good job of it, too. The problem is that this has now come back to haunt him. Democrats spent the past year complaining about how McConnell could do all this stuff and stay below the radar with it, not getting beaten up by the press for his tactics because they were so arcane. Back then, that worked well for McConnell. But now, staying below the radar is hurting him. Filibusters are pretty limp affairs these days, which makes them not just boring to reporters, but invisible to your supporters too. In the end, if Harry Reid had forced McConnell and his team to show up on the Senate floor and make a real production out of their filibusters, he might be in better shape with his constituents right now and his endorsement of Trey Grayson might be worth a bit more. Plus, of course, there’s the fact that McConnell lost and Obama won. There’s just no excuse for that. But losing in a blaze of glory probably would have done him more good than losing in the Senate cloakroom.